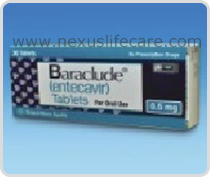 Uses:- Baraclude Tablets is used to treat chronic hepatitis b. It also helps prevent the hepatitis B virus from multiplying and infecting new liver cells. Side Effects:- Muscle pain or weakness, numb or cold feeling in arms and legs, trouble breathing, feeling dizzy, light-headed tired.